This entry was posted in Uncategorized and tagged Anglican, Bible, Disciple, Bethany, Bible, Christianity, Death, Disciples, discipleship, Dominican, Dominican Order, Episcopalian, Gospel, Gospel of John, Jesus, Lazarus, Lent, Love, Mary and Martha, Moral Theology, Pastoral Care, Religion, Resurrection, Salvation, Scripture, Spirituality, The Kingdom of God, Theology. Bookmark the permalink. The contrasts keep coming! Wonderful story, Brother. St. John’s Gospel is chock full of contrasts, isn’t it? Have a wonderful Sancta Semana. “Forbid it, Lord, that I should boast, save in the death of Christ my God. Mary was taking her most expensive perfume and the crown of her glory, and pouring them on Jesus’ feet- what a response! Yes, I hope (but doubt) that my response would have been so immediate and “careless”. She reminds us of our call to love recklessly, as our Savior did. Jesus has a really good point here “Leave her alone, so that she may keep it for the day of my burail. 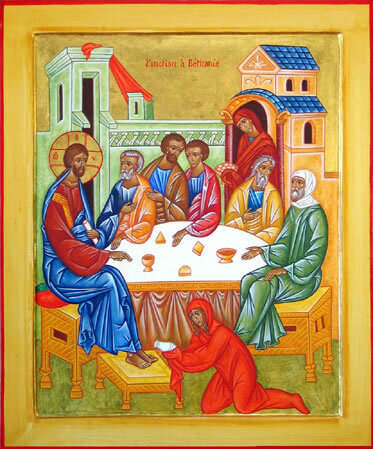 For the poor you always have with you, but you do not always have me.” Judas was obviously just trying to steal stuff, but Jesus knew that and let Mary continue in her worship. Mary also gave no heed to what everyone else thought while she was worshiping the Lord, and I think that is a lesson that we all need to learn. It’s certainly a lesson I need to learn. Thanks for your thoughts, and your support.